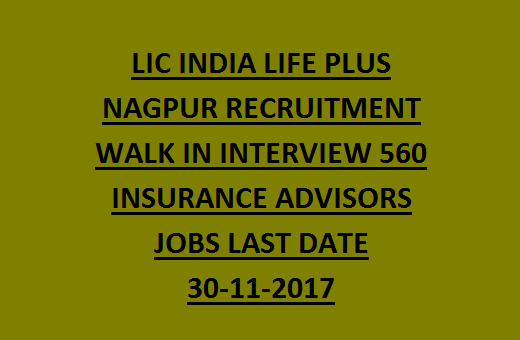 interview or send their application form or resume before 30-11-2017 to the given email address of recruitmentlic6@gmail.com Nagpur Branch office. Those candidates who are having the communicational skills and convincible skills he/she can apply for these vacancies. Insurance sector is the one of the major employment creating sector in India. Insurance sector growth is increased tremendously in the past 5 years with the help of technology. Working with LIC is a great opportunity to increase the earnings. 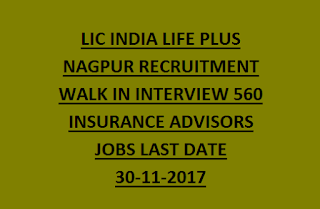 For more details regarding this LIC Life Plus Insurance Advisor Jobs information please see the details furnished below. Basic thing of LIC Advisor is giving Publicity of LIC Plans and selling them to earn high Income. There are total 560 Insurance Advisor Vacancies available. Anyone can Join in LIC as an a Advisor who needs Extra Income..
18 years is lower limit and upper age limit is 64 years. 3. Candidate Must have qualified the IRDA Examination. 4. Advisor License will be provided by IRDA. Rs.6000/- monthly stipend will be given in 1 year training period along with commissions. Selection will be held based on personal interview. At the time of attending personal interview the candidates must have carry all educational qualification documents, Address Proof, Pan Card with 5 photos. For more information please visit the link given below.. Interested candidates can submit their application form in LIC Branch office of Nagpur or can send their application form to given mail id.